Although difficult to distinguish from M. myotis and M. blythii, M. punicus has very large and wide ears and fluffy light brown fur. It is known to forage over areas with little or free of vegetation, such as semi-deserts. This species roosts mainly underground and in small crevices and can share nurseries with other species (e.g. M. schreibersii). The diet of the Maghrebian mouse-eared bat consists mostly of grasshoppers, crickets, beetles and moths, which are either picked from the ground or caught in flight. This species is believed to be largely sedentary as there are no records of long-distance migration. Decreasing according to the IUCN RedList. 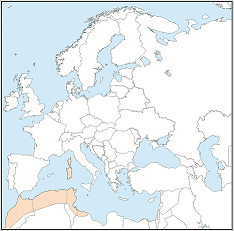 The Maghrebian Mouse-eared bat can be found in northwestern Africa (Morocco, Algeria, Tunisia, and to western Libya) and also on Corsica, Sardinia and Malta. Since colonies can are mostly located in caves popular with tourists, human disturbance is a major threat. Other threats include changes in land management and agricultural pollution. In North Africa, this species is collected for traditional medicinal use.